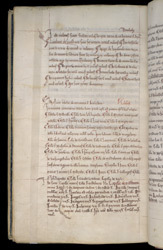 This copy of the Four Gospels has notes on the final flyleaves relating to S. Augustine's abbey, Canterbury, and the main scribe has been identified as the scribe of a number of other Canterbury books, which makes it almost certain that this manuscript was written there. This is the first of several pages, originally left blank at the end of the volume, which now bear records of the revenues of St. Augustine's. The first section records knights' fees, and the second is a list of churches held by the abbey.